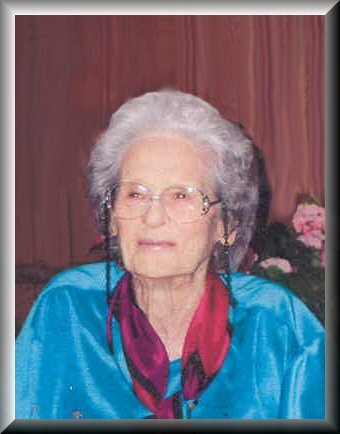 Hazel Leota Brock, age 91, of Kermit, went to be with her Lord on Sunday, August 22, 2004 at her residence. She was born the 18th of September 1912, in Timpson, Shelby Co., TX. She was the daughter of a farmer and schoolteacher, Cornelius Allen Bogard and his wife, Una Belle Kyle. The Bogards moved to West Texas, Vernon/Quanah area in 1920. After graduating from Quanah High School, Quanah, TX in 1929, Hazel attended Ranger Junior College, Ranger, TX, then taught grades 1-7 for one (1) year at Star Valley School, near Chillicothe, TX. In 1931, Hazel attended Texas Tech University at Lubbock for one semester until all of her students finished picking cotton and harvesting for the year and they returned to school. For four years, she taught at the Medicine Mound School in Medicine Mound, TX, being the first teacher to be hired from the hometown area. She taught grades 3 and 4 for two years, then grades 2 and 3 for two years. After the School District began hiring only affiliated teachers, she went back to Star Valley and taught in the one teacher school again in 1935-36. Hazel married Leo Langford Brock on April 25, 1937 in Chillicothe, TX. Their next several years were spent traveling with Leo’s job with Gulf Oil Company in seismograph, or “doodle bugging”, and having two daughters, Sandra Kaye and Celia Belle. After several years of moving from place to place with Leo’s work, Hazel returned to college in Crosby, North Dakota where Leo was stationed. She was only allowed one semester there as Leo was transferred to Kansas, then on to Donaldsville, LA. Hazel then attended classes at Nacogdoches, TX and earned her Bachelor of Science Degree in August 1955, from Stephen F. Austin University. She taught 4th grade in Kirbyville, TX during 1955-1956, then moved to Jasper, TX where she taught 3rd grade for 4 years. Hazel received her Masters Degree in Education in August 1959 from Stephen F. Austin as Sandra finished High School in Jasper. Leo retired from Gulf Oil and they moved to Kermit, TX in August 1960, near his sister Melba Carr (Melba has since moved to California and passed away January 31, 2002). Hazel taught 3rd grade in Kermit for 4 years, went to Sul Ross State Teachers University to earn her counselor’s certificate, and was Counselor at Kermit Junior High School for 15 years. She was Student Council Sponsor, administered commercial academic tests as well as aiding students with various tasks and problems. Hazel loved her job, the students, her co-workers and staff. Her memories about her work with the students of Kermit have always been her favorite subject since retiring from the school system in 1975. She was a member of: Texas Classroom Teachers Assoc., KISD Retired Teachers Assoc., Lifetime member of Texas State Teachers Assoc., Volunteer/Member of Texas Youth Commission 1990, Eastern Star, Jasper, TX, Delta Kappa Gamma, Kermit, TX, National Retired Teachers Assoc. and Charter Member/Officer of the KISD Credit Union aka Winkler County Credit Union. Leo and Hazel had two daughters, Sandra Kaye Brock, who passed away in October 2000, from the neuromuscular disease, ALS, or Lou Gehrig’s disease. Sandra had also received her Bachelor of Science Degree at Stephen F. Austin and taught High School English until receiving her Masters Degree and assuming the position of Media Coordinator of the Keller School District, Keller, TX. Sandra was married and had three sons, Terry, Jamie and Jay Lucas. Terry and Jamie are both pilots for American Airlines and Jay is assistant manager of a door and window manufacturing company. Terry and his wife, Carol, and their three sons, Dustin, Daniel and Jacob live near Denton as well as do Jamie and his wife Michele and daughters Jessica and Jennifer. Weldon Lucas, Jr. (Jay) lives in Corinth with his wife Kimber and sons, Kyle and Brock. Their second daughter, Celia Belle Brock, married Charles Ray Bolf and lives in Kermit. Celia received her Bachelor of Arts degree at UTPB in Odessa and teaches elementary school in Kermit. They have two sons. Thomas Bolf is manager of the Kermit office of Tessco Electric. He and his wife, Dina and their two sons Jerid and Jeremy live in Kermit. Lang Bolf is an electrician for the City of Austin Power Company. Lang lives in Bastrop with his wife Jeanette, stepson Bradley Sutton, and Lang’s son Marcus. Another stepson, Justin Sutton lives in Midland. Hazel has been a loving influence to all of her family and we will remember her patience, concern and sincerity about each person’s life that she touched. May God bless Hazel and receive her into his Kingdom. Those left behind to cherish Hazel’s love and memories are her Daughter: Celia Bolf and husband, Charles, of Kermit, TX; Two Brothers: Alton Bogard of Midwest City, OK and Herschel Bogard of Anniston, AL; Two Sisters: Lois Poissoit of Conroe, TX and Stella Sims of Arlington, TX. Five Grand sons: Thomas Bolf and wife, Dina, of Kermit, TX, Lang Bolf and wife, Jeanette, of Bastrop, TX, Terry Lucas and wife, Carol, of Aubrey, TX, Jamie Sim and wife, Michele, of Crossroads, TX and Jay Lucas and wife, Kimber, of Corinth, TX. Thirteen Great – Grandchildren: Jerid and Jeremy Bolf of Kermit, TX, Daniel and Jacob Lucas, of Aubrey, TX, Dustin Lucas of Weatherford, TX, Jessica and Jennifer Lucas of Crossroads, TX, Kyle and Jay Brock of Corinth, TX, Justin Sutton of Midland, TX, Bradley Sutton and Marcus Bolf both of Bastrop, TX and Ashton Prather of Kermit, Texas. Hazel was preceded in death by her husband, Leo Langford Brock, in 1989.